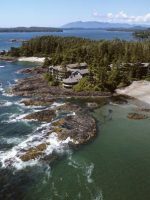 This unique property has a variety of accommodations – from multi-bedroom, beachfront cabins with Jacuzzis, to park-your-own RV or glamp in a provided RV – all within steps of gorgeous Mackenzie Beach. 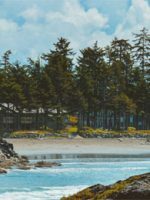 Mackenzie Beach is one of the most popular family beaches in Tofino because of its cove location that creates calm waters. Located only five minutes from town, Crystal Cove is ideal for families of any size or desired luxury needs. 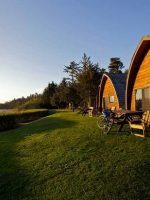 Kids will love the large, onsite adventure playground, having campfires on the beach or hanging out in a pint-sized tree houses in some of the cabins. There is an onsite coffee bar and free Wi-Fi and a staff that will feel like your family by the time you leave. This resort offers a variety of accommodation types. There are 34 beachfront and rainforest cabins with kitchens. You can park your own RV with all the RV hook-up amenities in one of the 60 RV sites or you can glamp in one of the resort’s RVs. Complimentary Wi-Fi can be found throughout the property and pets are welcome. 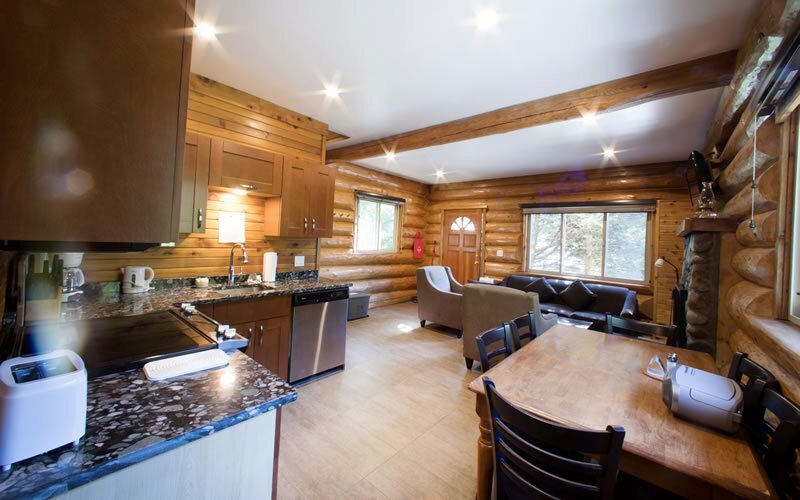 These adorable log cabins all include a fully equipped kitchen with a full size refrigerator, a BBQ and a Jacuzzi on the deck and a fireplace and flat screen television and DVD player in the living room. 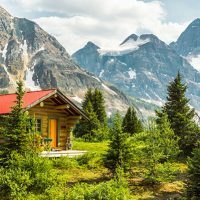 The one-bedroom and two-bedroom cabins can sleep between two and eight people. Some cabins feature bunk beds and others feature a sleeper sofa. All of the bathrooms offer stand up showers. 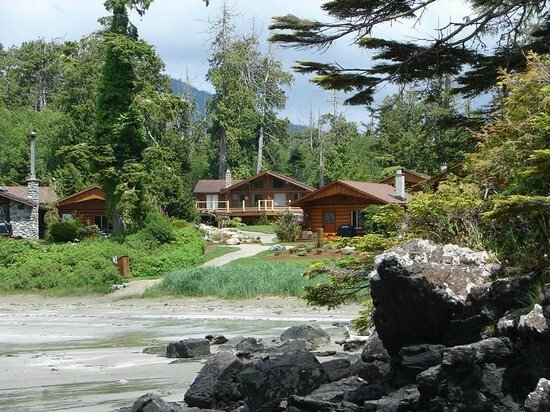 Some cabins offer direct beach access and others are set in the rainforest amongst the trees. Kids will love the two-story Treehouse Cabins, which offer an adjoining small tree house high in the trees where kids can play. The staff is also happy to stock your cabin upon arrival. 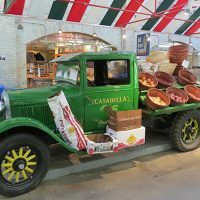 Provide your grocery list and they will do the shopping for you. You can also hire a personal chef if you so desire. There are nine “glamping” RV units available to rent on the property. So if your family wants the RV experience for just a few nights or for the week, you can rent one here. The spacious RVs are outfitted with a fully equipped kitchen, television and DVD player, queen bed and sleeper sofa, a dining table and a BBQ on the small deck with chairs and a fire pit outside. 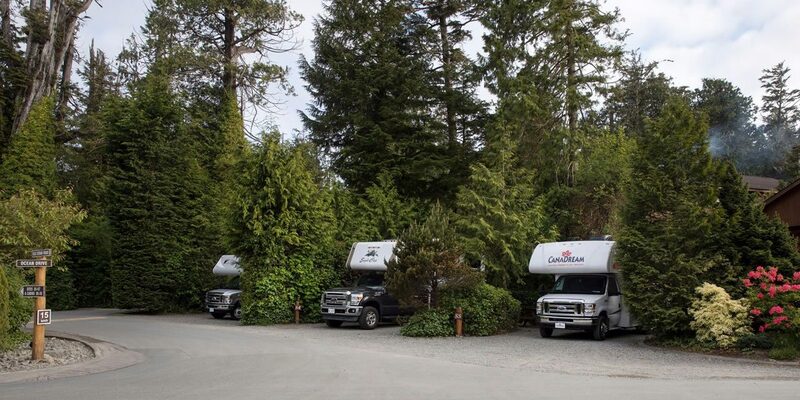 These RVs also have bathrooms onboard as well but the communal bath house with restrooms, showers and laundry facilities is a just a short walk away as well. Each RV site offers electrical, water and sewer hook ups, Wi-Fi, a picnic table, fire pit and BBQ. A communal bath house with restrooms, showers and laundry facilities is a just a short walk away as well. Families can drive in and immediately feel at home. This is I think our sixth or seventh time at Crystal cove in a variety of cabins and it never disappoints. 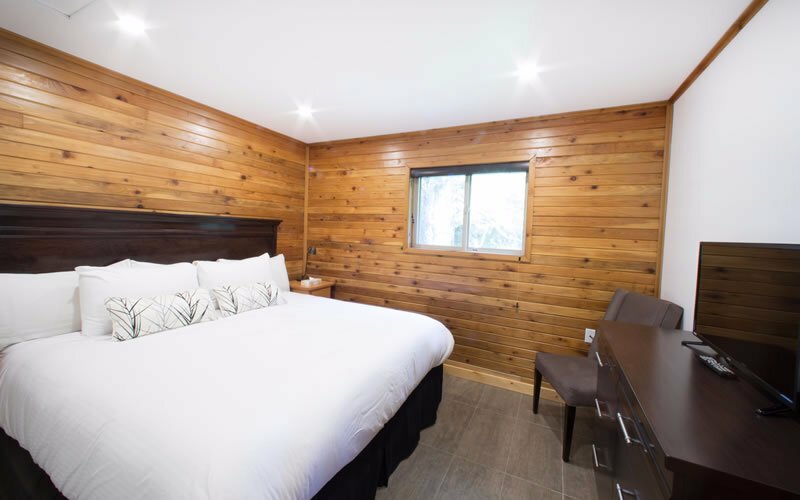 This time in one bedroom cabin #11 which has a little less of a cove view than some others but gives a more private aspect with outdoor hot tub and separate little patio with a bistro table and chairs to enjoy a glass of wine and take in the view. 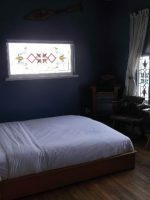 Cabin is very well equipped, has underfloor heating in each room plus a wood stove. The other thing I liked in this cabin vs some others we’ve stayed in is it has a two head large walk in shower and also a king sized bed. The staff will texted us a couple times during our stay to ensure all was good with cabin etc. and to contact them if we needed anything. I cannot rate this place highly enough. Very clean, luxurious cabins, ours had a hot tub. Fabulous views of the cove, lovely to wake up to every morning. Staff very helpful but unobtrusive. The cabin had everything you could think of. Kitchen utensils, bedding, towels. Robes for use to the hot tub, underfloor heating. We can't wait to go back. 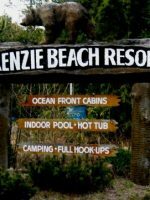 Mackenzie Beach is just steps away from the cabins and the RV area. It offers calm, shallow waters protected by a cove perfect for paddle boarding and wide, soft sand for beachcombing and walking. The water stays chilly here around 50 degrees but the kids will still love to play at the beach. Beach toys are available to use at the office. 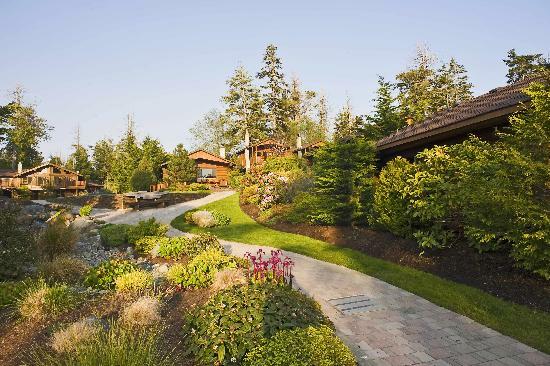 Several of the cabins are also beachfront and families can walk just a few steps from their deck to the sand. The large outdoor playground can be found in the center of the Crystal Cove community. The colorful playground is as much an art piece as it is a playground. It offers climbing areas, slides, a tire swing, a teeter-totter and a pirate ship constructed by a Tofino teenager. During the summer months and some holidays, the resort offers family activities called “Kids at the Cove,” where kids can enjoy scavenger hunts, nature hikes, Easter egg hunts and much more. Some of the cabins offer personal, outdoor fire pits but small beach fires are also permitted during low tide. Firewood is available for purchase as well as S’mores kids in the summer months. Don’t forget a marshmallow stick! The resort sells roasting sticks that are handmade by a local artist and perfect for roasting marshmallows. DVDs and board games can also be borrowed from the office as well. While there is no onsite restaurant there is an onsite coffee bar, complete with Starbucks coffee and homemade baked goods. Families will always find treats like ice cream, hot chocolate and S’mores kits here too. Complementary Wi-Fi can be found throughout the property. Dogs are very welcome to stay at Crystal Cove. Each cabins offers a personal parking area. Laundry facilities for the RV park can be found in the bath house. 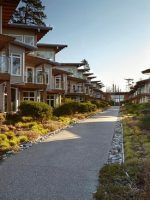 The summer months are Tofino and Crystal Cove’s busiest times but really its busy almost year round at this resort. The cabins are booked throughout the year and busiest from about May through October. But many still visit in the winter months as well for storm season, which runs from late October through February. The weather is colder but it rarely snows. Instead, Tofino receives intense rains and winds in its winter months, which makes for great storm watching on the Pacific Ocean. Tofino is located on Vancouver Island, which offers no bridges from the mainland. So a ferry is needed to reach the island by vehicle. Vehicle ferries from Vancouver to Vancouver Island take about two hours and it is then about a three hour drive to Tofino. A small number of flights to the small Tofino airport are also available and Crystal Cove offers an airport shuttle. The resort itself is easily walkable. The beach is not far from any location on the resort. Town is about a five minute drive away. Biking and walking are the most popular and convenient ways to get around Tofino but a vehicle is also nice to have. However, parking can be at a premium in town.